A liquid fertiliser comprising ammonium and phosphorus recommended for vegetables, fruits, vines and ornamentals for promoting growth in fruit and vegetable crops. 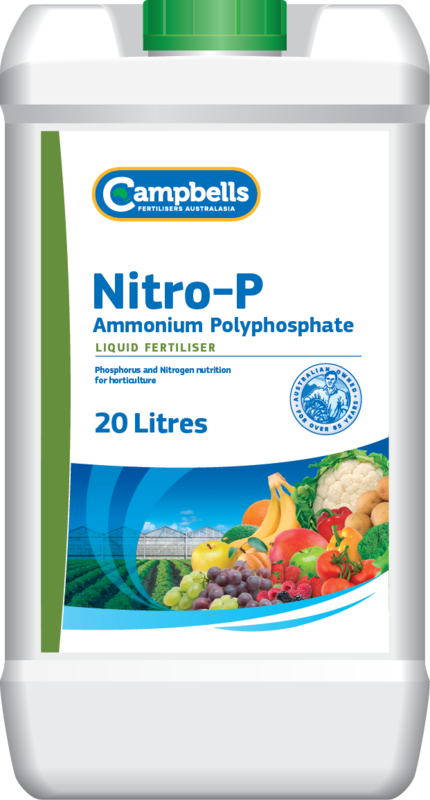 Campbells Nitro-P liquid is ammonium polyphosphate providing both nitrogen and phosphorus, which are two essential elements for your crops early development and vigour. The ammonium polyphosphate formulation of Nitro-P offers approximately half of the P in an immediately available form. The remaining P gradually becomes available to the plant in the days and weeks after application. Campbells Nitro-P is suitable for application via fertigation, boom-spray application to the soil or via liquid fertiliser injection into the soil at planting. The specific combination of nitrogen and phosphorus has an ideal fit in early crop nutrition; however it can be applied at any stage of crop development as required. General fertigation rates for horticultural crops are between 25 to 80 L/ha. Specific recommendations on rates, application and timing can be determined from soil and tissue test results, crop factors and local conditions. See the Product label for comprehensive information on rates and application methods. As with any fertiliser program, it is best to seek advice from your Campbells Nitro-P liquid distributor or your local agronomist. Do not mix with Calcium or Magnesium based fertilisers.